Last Wednesday, September 23, Urban Standard coffee shop had a “First Day of Autumn Pop-Up Shop” hosted by The Orchard Creative Community. Urban Standard opened in November of 2007, with the idea of creating workshop/gallery, where the public could see the work of local artists. The pop-up shop that was hosted at Urban Standard did exactly what its founder wanted. The Orchard is an intentional group of creative ladies that have been planted here in Birmingham together to create, encourage, lift-up and overcome. 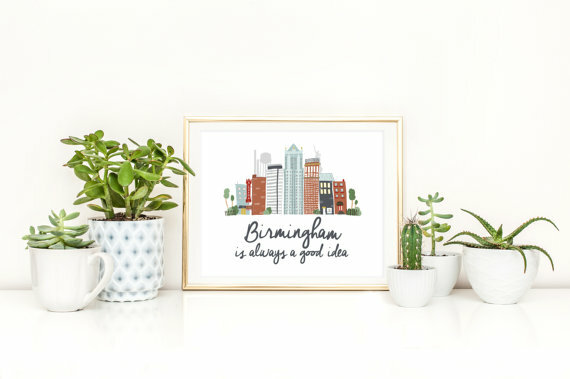 Local Birmingham artists were featured in this shop from Carrie Rollwagen, the author of The Localist, to the MOM-UP movement. Beautiful calligraphy, letterpress goodies, photography services and unique design pieces. All of the artists that were at the pop-up show are listed below with website links. We recommend doing some holiday shopping online with these Birmingham locals. Jessica of Empress Stationery was selling calendars and prints, find more at her website. 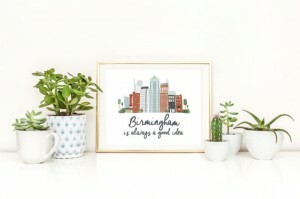 Emily of Emily Wells Designs was selling Birmingham prints, game day designs, and cell phone cases. Shop for yourself or a friend at her website or Etsy shop. Carrie Rollwagen was promoting her book and selling prints. Find out more at her website.